Wilkes A. 2017. 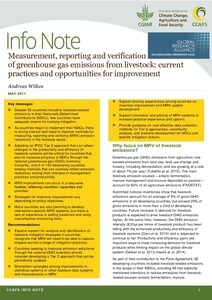 Measurement, reporting and verification of greenhouse gas emissions from livestock: current practices and opportunities for improvement. CCAFS Info Note. Copenhagen, Denmark: CGIAR Research Programme on Climate Change, Agriculture and Food Security (CCAFS).